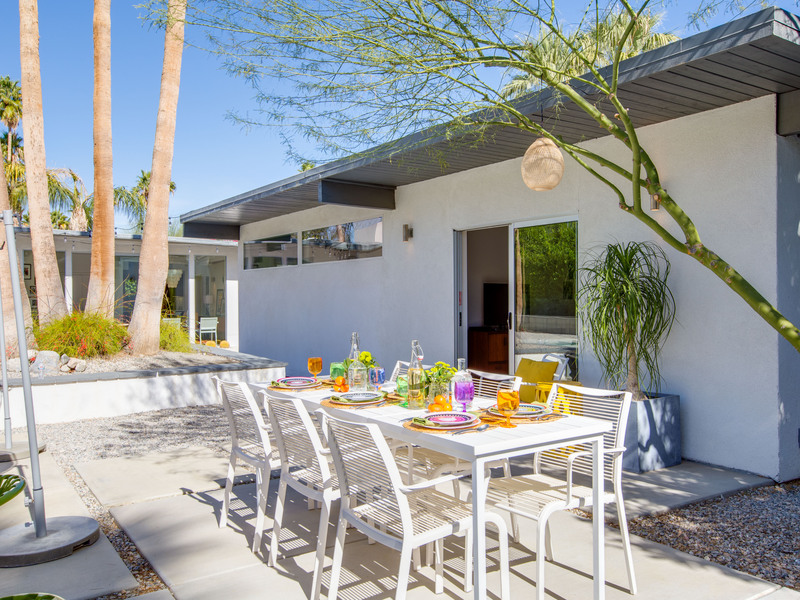 The Arrow is a beautifully restored mid mod property (circa 1959) that captures the swank and sophisticated vibe of Palm Springs yesteryear while being very "next century" at the same time. 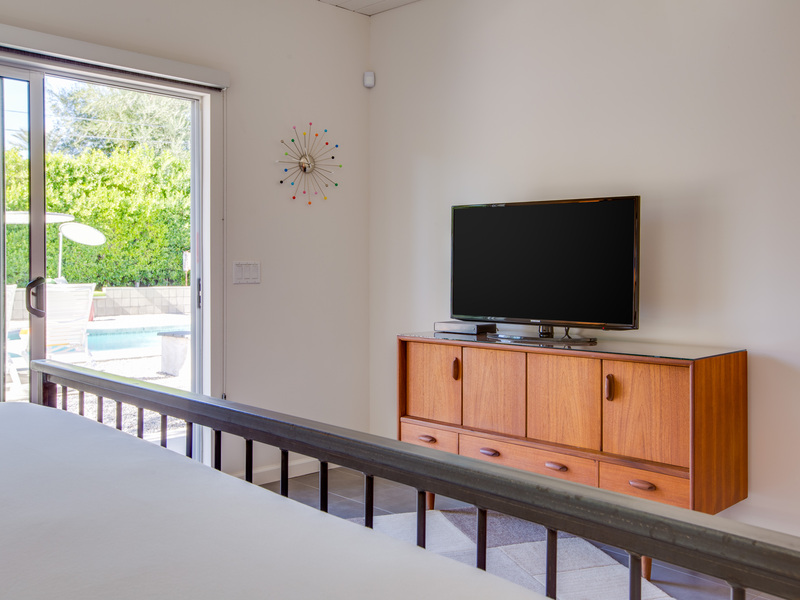 The extensive remodel respects the architectural pedigree of the home while updating it for the way we live today - hi speed WiFi, five flat screen TVs, new kitchen, new baths, high-performance climate control system, and tens of thousands of dollars in upgrades and designer touches. Upon walking through the impressive double door entrance, you'll know you have arrived in paradise. 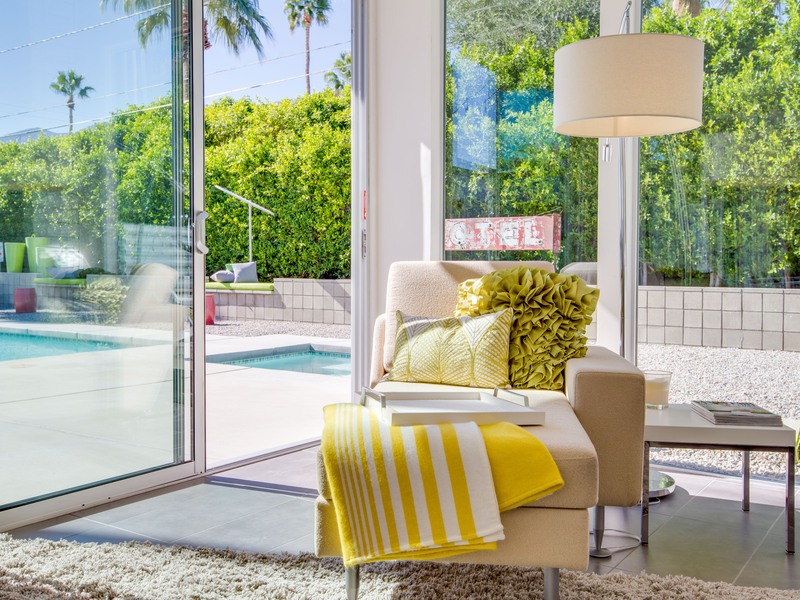 From the entry - you look across the open concept living area - to walls of glass that reveal stunning mountain views and the fabulous pool yard. The great room has comfortable lounge seating and an informal dining area. 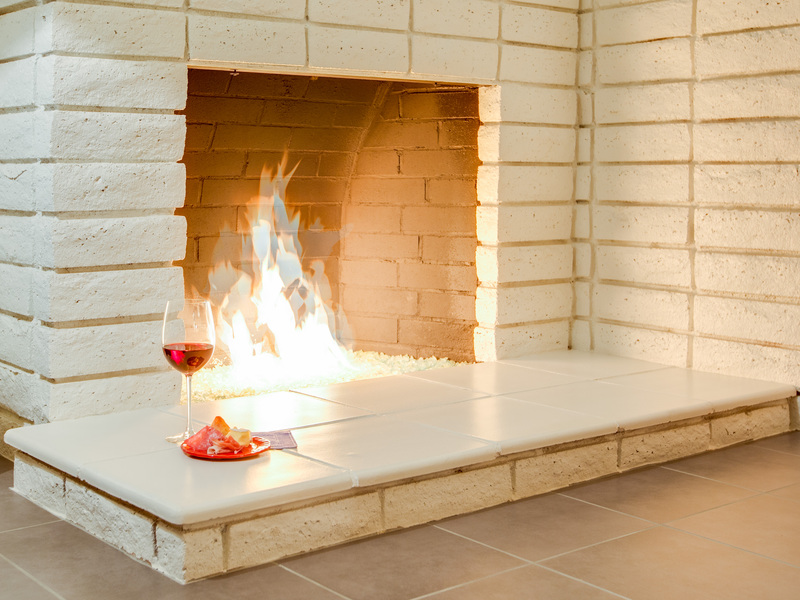 There's a fireplace, a large flat screen TV and plenty of room for your entire group to spread out or hang together. 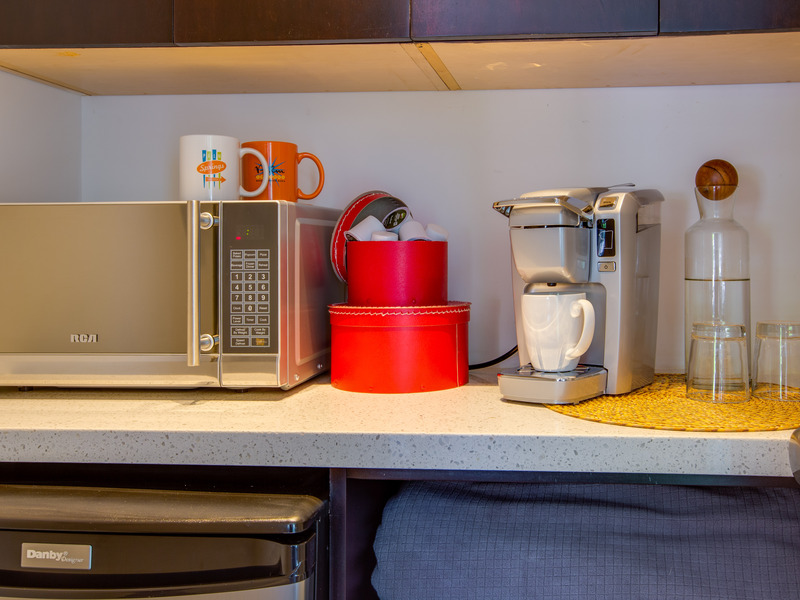 The well-stocked kitchen has been space planned for individual or group meal prep. The sleeping quarters have been designed like luxury suites in a boutique hotel. 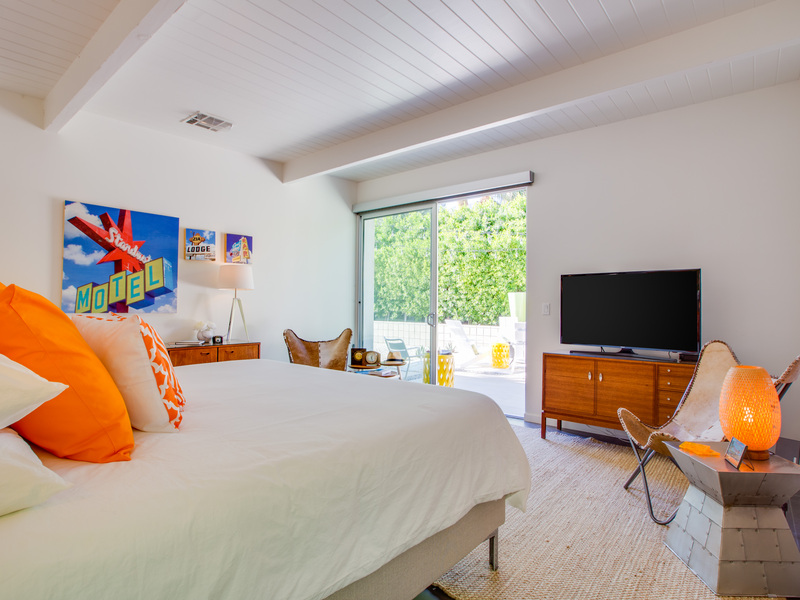 All feature hotel-quality mattresses, ample closet space, and flat screen televisions. 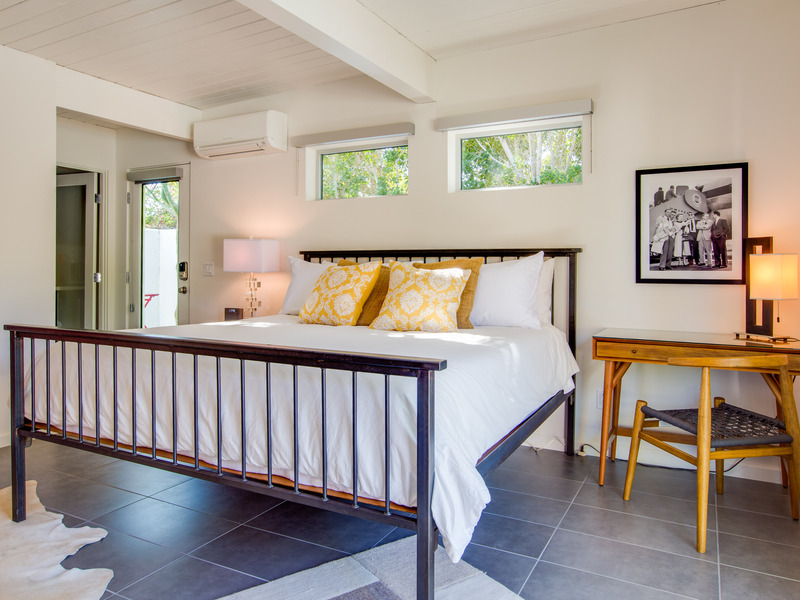 There are three bedrooms in the main house (a king suite and two queen guest rooms) plus a separate casita with a king bed and private ensuite bath. 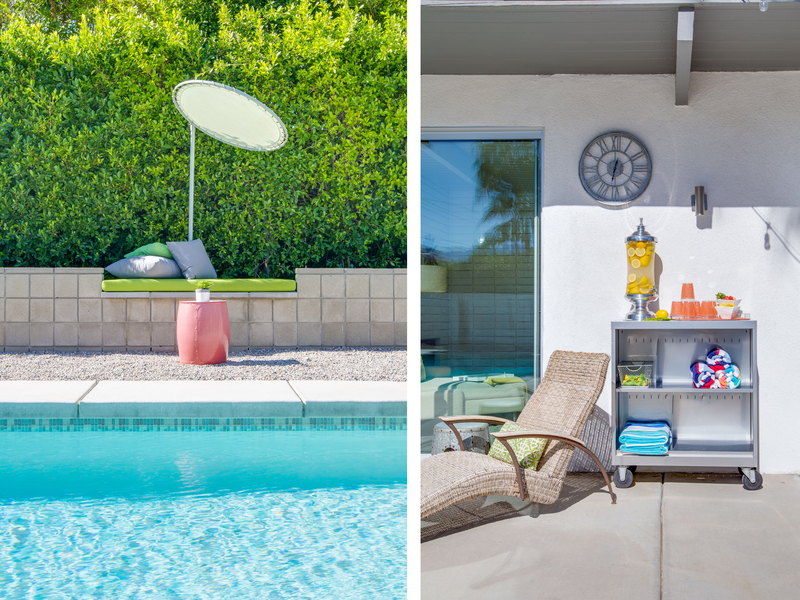 As beautiful as the interiors of this home are, it is the pool yard at The Arrow that elevates it to deluxe status. The entire yard has been walled and gated for privacy. Mature plantings and desert landscape dot the perimeter for additional privacy. 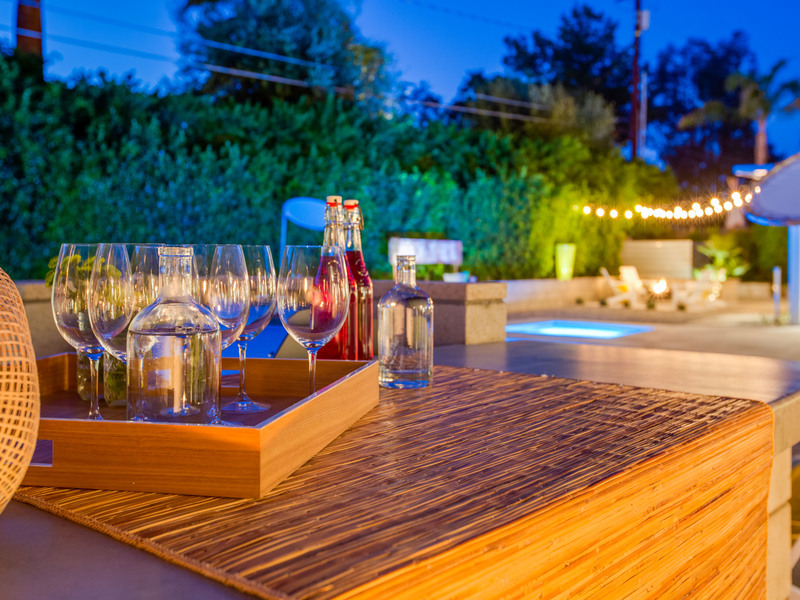 The sun-drenched pool is surrounded by many different seating areas, a bar and cook station, alfresco dining, chaise lounges, sun diverters, and two fire features. 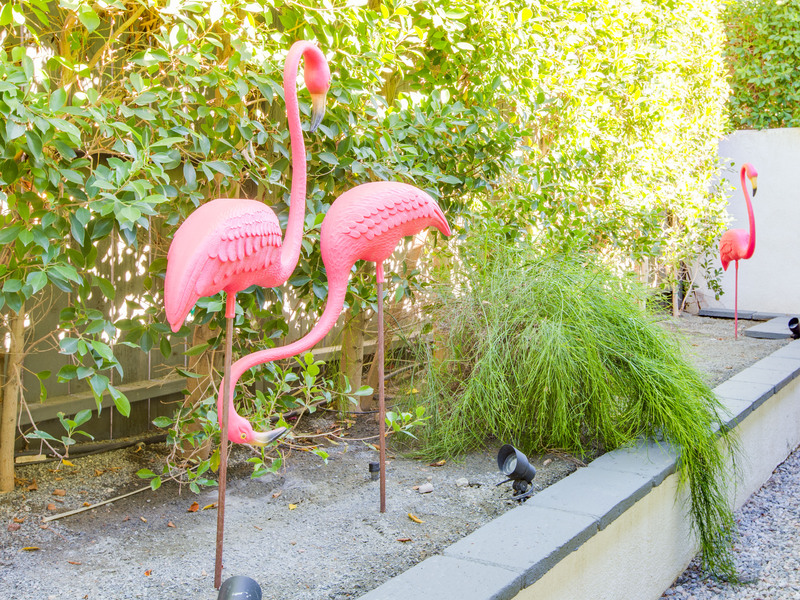 Throughout the property you'll find rescued midcentury artifacts and treasures like an old motel sign, pink flamingos and the huge retro chic arrow that gives the property its name. Immensely Insta---grammable with photo opps everywhere! You'll spend leisurely days by the pool, spectacular evenings dining al fresco, and quiet nights chatting fireside under the stars. And yes, moonlit swimming is strongly encouraged. 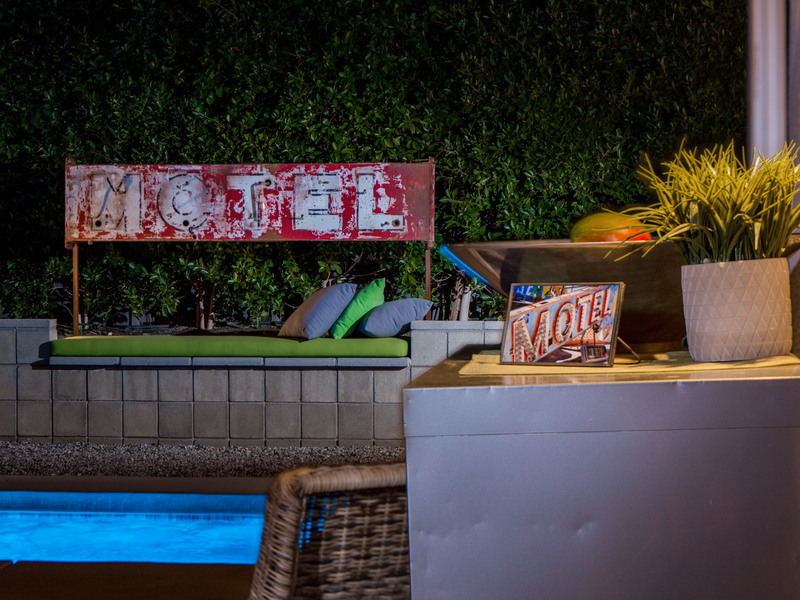 The Arrow is the perfect Palm Springs getaway - where it's all about relaxing in the Palm Springs sunshine. 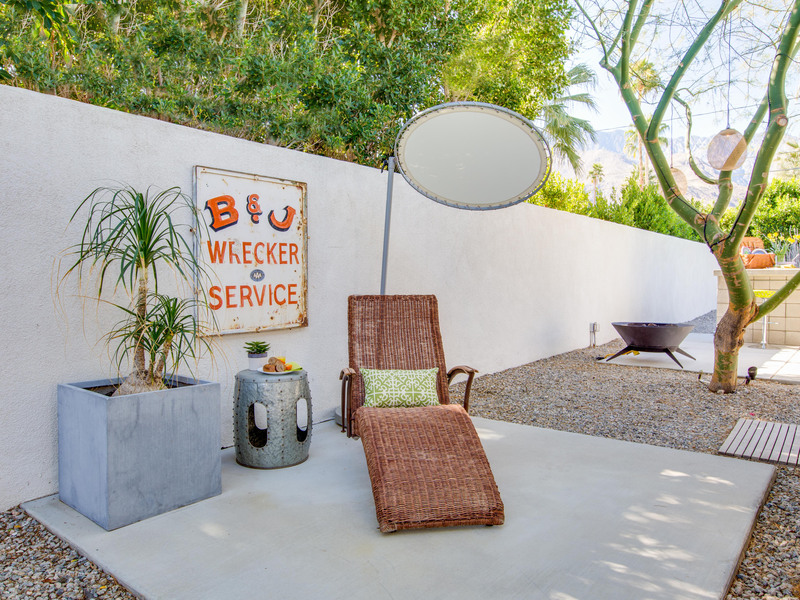 The Arrow is tucked away on a residential street less than a mile from the world famous Palm Canyon Drive. You'll be in walking distance to hip and trendy spots like Sandfish Whiskey & Sushi Bar, The Draughtsman, Customs Coffee, Ricks Diner, and Ice Cream and Shop(pe). The Riviera and Toucans Tiki Lounge are just a short stroll from your front door. 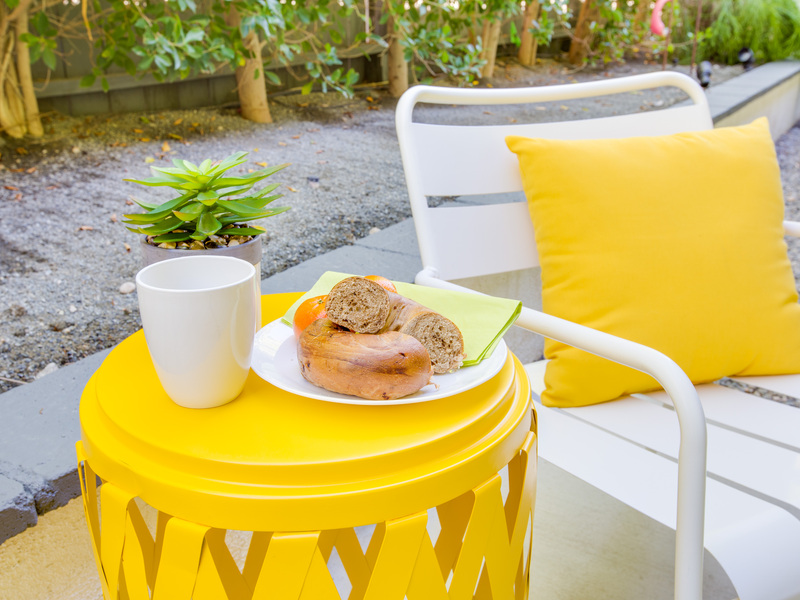 Neighborhood conveniences like grocery stores, sandwich shops, and workout facilities are all nearby. The Arrow is perfectly suited for those who prefer the finer things in life. People who travel below the radar will truly appreciate this property and what it has to offer. 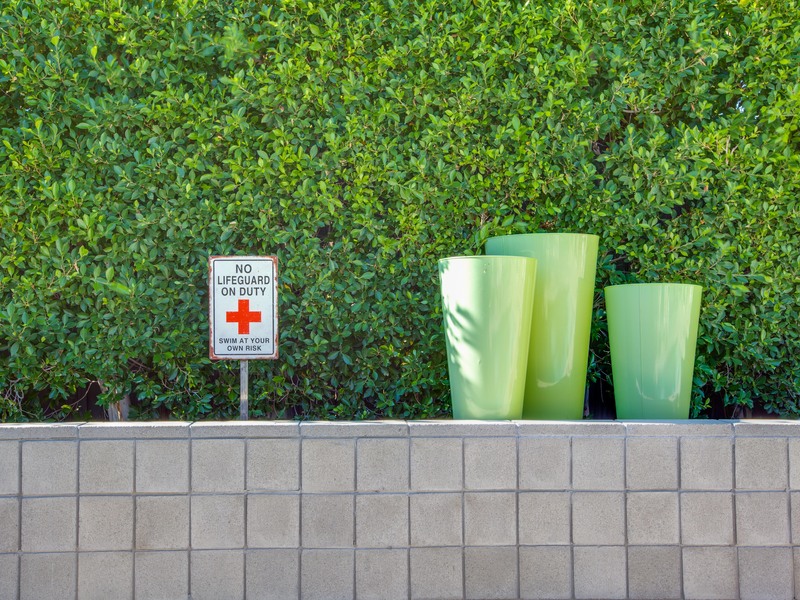 Optional concierge services including daily maid service, poolside massage, pre-arrival grocery stocking, and private chef can be arranged with three-week prior notice. "This place is better than the photos. The house is well appointed to entertain two families with kids. The outdoor space was well served for relaxing and bbqing. The indoors was very comfortable, the beds were amazing, the kitchen well equipped for cooking in all week and the decor was a hit. We were sad to leave but will definitely book this place again. Thank you ACME for exceeding our expectations!!" "I can't say enough great things about our stay here at The Arrow. The comfort level was so high, we never wanted to leave. The details, amenities, location, design, and all around feeling of the place made for a fantastic week away from it all. We enjoyed the pool and spa with its colored lights, BBQ'ed some fantastic meats from the grocery store around the corner, and binge watched our favorite shows. When we ventured out of the house, shopping, entertainment, golf and hiking was close by. We love the Thursday Night market downtown! We especially liked the self contained Casita that my in-laws used. It gave us all room for privacy from each other. 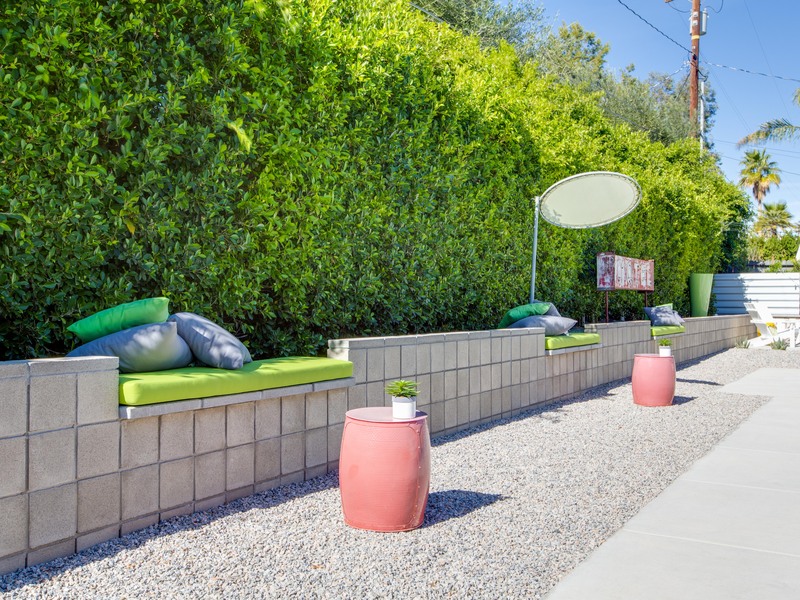 We highly recommend looking no further than The Arrow for your next stay in Palm Springs and can't wait to go back." Stunning! I want to live here! "This place is absolutely gorgeous. Better than you can imagine. 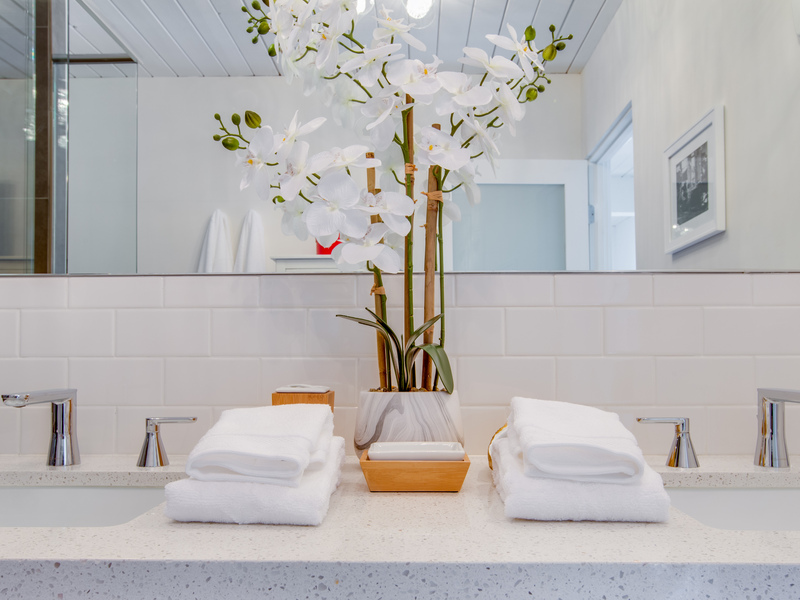 The design, furniture, artwork, cleanliness, outdoor areas all exceed expectations. I wish I could give it more than 5-stars." "I've stayed here more than once and will definitely come back. Every detail has been thought out, it is wanting for nothing. 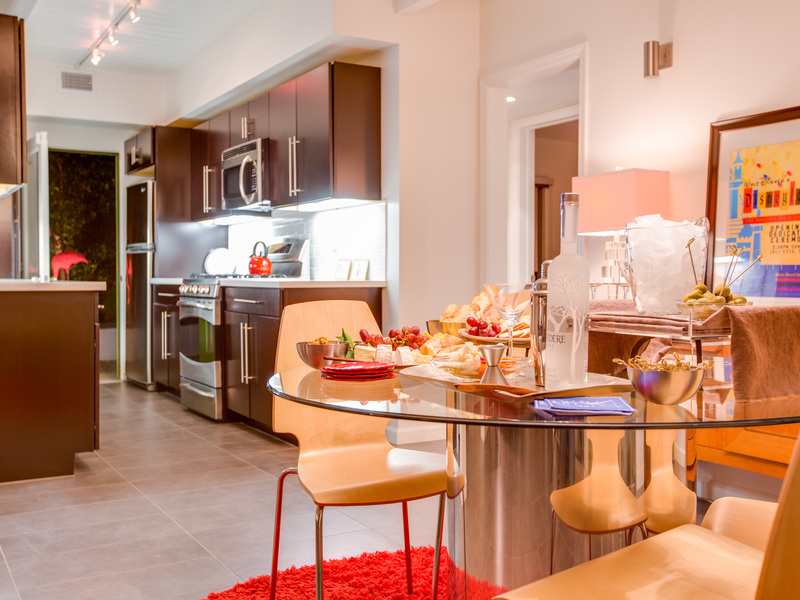 The design is beautiful, has all the amenities and is close to the main part of town. Highly recommend!!! "